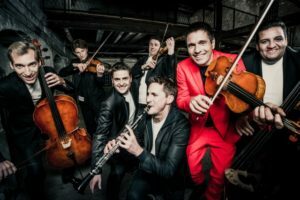 A rip-roaring, seriously swinging chamber ensemble, Philharmonix is composed of six members of the Berlin and Vienna Philharmonic Orchestras. With repertoire ranging from Satie and Sting to Brahms and Queen, the ensemble performs jazz, klezmer, Latin music, and more mixed in for good measure. Philharmonix’s golden rule? Anything goes, as long as it’s fun. Her Excellency Emily Haber, Ambassador of Germany, and His Excellency Wolfgang Waldner, Ambassador of Austria, are honorary patrons of this engagement. This program is part of the European Month of Culture.